Of the most obvious things written on the Dentox blog this year, the following sentence has got to be in the top 10: taking the Dentox injectables course is great for your career. Whether you work in the field of medical aesthetics currently, and are interested in widening your focus, or if you’re a medical professional looking at expanded horizons in the private sector; this course has everything packed into one amazing day. The next training day is scheduled for January 20th (8:00 am to 5:30 pm) at the Doubletree Hotel Marina Del Rey and there are many reasons to take advantage. We whittled away any hyperbole and made a list of 5 straightforward, common-sense reasons to take the Dentox injectables course in LA this year. The man is a pioneer, innovator and a solid human being. He’s been in this field for over 35 years, and has patents on some remarkable botox-related innovations. He’s taught around the world about facial aesthetics and is sought out as an expert among experts in the field. What resonates most with participants is Dr. Katz’s natural charisma. His depth of knowledge is on display in all aspects of the course he’s helped put together and, just in conversation; his asides are brilliant and insightful. No hyperbole here, just the straight goods. A good job of summarizing the doctor’s experience has already been done in the “about Dr. Katz” section of the training information page. We encourage you to read more there or on this very blog. Of greatest significance to you is the platelet-rich plasma therapy (PRP) segment of the course. The product and procedure are all detailed in the course profile section on the Dentox training page. Understated there, however, is how natural PRP is when compared to traditional fillers. As you likely know, this is filler sourced from the patient’s own blood and it ameliorates the natural healing process of the body. This is revolutionary because it fits perfectly into the common-sense niche taking hold in the field since its inception; it’s natural! Not only do we think PRP is a healthy innovation, but it’s a very lucrative option for all professionals in this industry. Take the course for the PRP seminar, but stay for the networking! Often understated is the importance of networking with colleagues in our industry. Regular professional collaboration is the fertile soil in which innovation tends to grow in any field. Innovation (and invention) in medical sciences can be measured monthly, with often groundbreaking discoveries and protocols emerging quite regularly from groups dedicated to research and learning. Integral to investment strategies in any scientific field is a plan to collaborate. We need to recognize, and not take for granted, that we are better together. And through networking with colleagues worldwide, we’re best serving our patients’ needs and moving ever toward a bright future. In short; show up early to the course and talk to fellow professionals over coffee! Not everyone in this line of work is a keen salesperson. Nevertheless, marketing is an integral component to this work, especially as owner-operators and managers. The Dentox training intends to have you covered here. The marketing material in the course is designed to be accessible; it’s easy to follow, and simplified without sacrificing meaning. The marketing and patient communication sections elegantly explain and help form in you a solid rubric for organizing front desk and bedside messaging. Compassion and expert knowledge is key! This list could go on and on. Thus, we’ve decided simply to condense the rest of our thinking into this item. 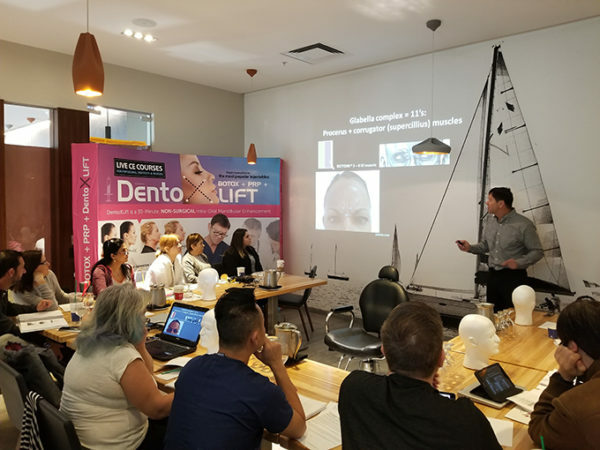 The Dentox team is particularly proud of how this training program packed so many different income-generating skills and ideas into one day. In other words, it’s a very dense course. The density of expert knowledge and learning makes this course worthwhile. We invite fellow medical professionals to learn more at the Dentox training site or read more of the wonderful content here on this blog. Note: To get the details on place, time and sign-up, skip to the end of this article. To find out more on why you need to take this course, read the article! What were your New Year’s Resolutions for 2018? Probably career-related, right? Work harder and make more money is usually in the top 3. In the aesthetic health services field, folks will usually just tell you, career-wise, they’re already living the dream. And, they’re not lying. As fellow aesthetic care professionals here are Dentox, members of our team derive substantial satisfaction from the work they do. Part of that satisfaction comes from the truly ground-breaking training courses we offer. If you’re in the business, we encourage you to read on to see what our Dentox Botox/PRP/Fillers course in Los Angeles can offer in terms of realizing those dreams for 2018. We think of the Dentox training course as a career-jump-starting opportunity. The course focuses on training clinic nurses, doctors, dentists and other qualified medical professionals to be certified in Botox, Fillers and Platelet-Rich Plasma (PRP) injections. Our trainer for all courses is Dr. Howard Katz. His course, especially the PRP component, adds significantly to the portfolios and the breadth of the medical knowledge of participants. PRP is a blood refinement protocol that allows for a client’s blood to be used to fill lines, and speed healing. It’s been a tremendous boon to the aesthetic medical community. We believe that PRP fills a long sought out need to leveridge natural processes in the application of care to patient/clients. In short, this training will fulfil your New Year’s resolution if you resolved to provide better and more varied care options to your patients. It’s a lucrative skill set that just makes you a better professional. In education, there’s a thing called a teachable moment. They are small incidents in the natural course of life that provide us an opportunity to learn a valuable lesson. Education professionals are advised to take advantage of them whenever they occur. At Dentox, we encourage participants to be on the lookout for them too. During Dr. Katz’s training sessions, listen for little tidbits of valuable learning that occur. To hear a learned professional’s offhand remarks from a 35+ year career can enrich your learning experience. Though these moments vary according to place and time, we guarantee your experience will go beyond the subject matter of the day. We planned a course founded on a core of expert knowledge and skill, then gave it the room to evolve into an experience that will improve the practice of all participants. This course also explicitly teaches all of the content necessary to explain procedures effectively to patients. Essentially, the course prepares you to be a good educator and marketer in the medical aesthetics field. With all of its parts working synergistically to create a career-changing whole, the course can best be summed up as Powerful and Holistic. All the information can be found here, and details are available on the Dentox blog, here (if you’re reading this, you’ve already arrived). Best of luck to you in 2018! When you choose to take Botox training in Houston from Dr. Katz of Dentox, you’re not just choosing any Botox course. You’re choosing a one-day seminar that teaches you everything you need to know about Botox injection as well as details on dermal filler injection and the revolutionary new platelet-rich plasma therapy – exclusive to Dentox training courses. Dentox training is actually different from other choices in many ways. The difference starts with Dr. Katz, a Botox pioneer who has been teaching courses on the subject longer than anyone else. And the difference includes innovative new procedures you can’t learn anywhere else. With platelet-rich plasma therapy – or PRP treatment – you can give your patients better cosmetic outcomes and speed healing from common procedures. Using just a small amount of a patient’s blood that you refine with a centrifuge, you can create platelet-rich plasma that you can inject in much the same way that Botox and dermal fillers are injected. PRP can be used to speed healing of bone grafts and other complicated dental procedures and as an alternative to dermal fillers for filling facial lines and wrinkles. And since PRP is much less expensive to produce than buying pricey fillers – you can make it in just a few minutes in your office – you save on inventory needs and your patients save with every injection. No other Botox treatments training in Houston or anywhere else provides training on this revolutionary new technique because it was developed by Dr. Katz. You can train in just one day. There’s no other way to learn Botox, dermal fillers and PRP therapy in a single day than to take Botox training from Dentox. It’s quick, yet you get full training with nothing left out. More than $1,500 in income in 5 minutes is possible. No other training or continuing education program in Houston can offer such a high earning potential from a single patient – and you can repeat this simple process many times each day. Marketing is taught too. In addition to the medical skills, your Botox and Fillers course in Houston also include marketing, advertising and related skills so you can get more patients and get more from each of your existing patients too. It’s hands-on. 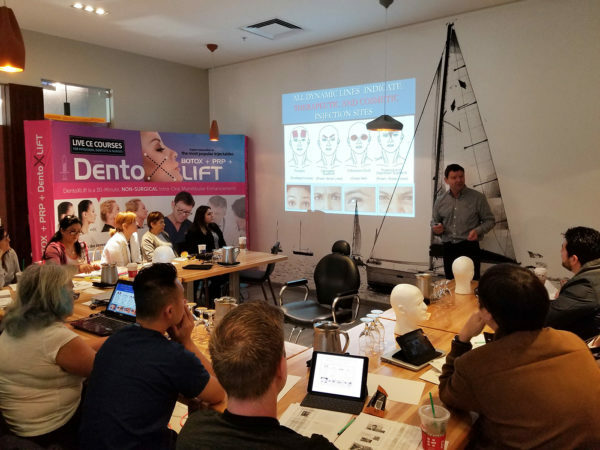 You learn by doing in this Houston Dentox training course – so you can be sure you’ve mastered the skills. Everything is live and in person, and recorded training sessions are available to review anytime. It’ something your patients already want. Clients already know what Botox is and how dermal fillers can help them, so you’re meeting a need or desire they already have. If you don’t fill this need, someone else will. No membership is needed. If you like, we’ll list you in our directory of Dentox-trained providers, but there’s membership fee and we never sell or share your data. When you make the smart decision to take Botox training in Houston from Dr. Katz, you’re benefiting from decades of experience and the latest innovations in the industry too. It just makes sense to choose the best when choosing Botox training, and it makes sense to choose revenue-enhancing Botox training in Houston over other continuing education courses. Why not learn more or sign up now? It’s a practical and sensible decision for your future. With so much potential, you and your practice can’t help but benefit. For over 30 years, doctors and dentists have been learning Botox injection hands-on from Dr. Howard Katz, founder of Dentox. Now, Botox training in Houston with Dr. Katz is here. Not only was Dr. Katz the first Botox trainer – making him the most experienced in his field – he also has his name on the patent application for the Botox product. No medical professional can claim a longer history with Botox. He also represents Dentox around the world in speeches and seminars. When you want to learn how to inject Botox into your medical and dental clients for cosmetic or therapeutic purposes, it makes sense to turn to the best trainer with the best program. When you choose the new Botox training Houston medical professionals can trust, you can learn in a single day how to improve glabellas, nasolabials, forehead wrinkles and smile lines for your patients in just 2 minutes without wasting materials. Medicals professionals who are licensed in Texas can bring along an assistant, nurse or patient and inject them right there in the seminar under the supervision of Dr. Katz and his team. If you aren’t licensed in Texas, you can learn on simulated skin while still getting the full course in diagnosing and assessing. The course also includes details on how you can successfully use Botox for migraine treatment, to reduce or eliminate pericranial muscle spasms, mitigate depression symptoms and more. By decompressing blood vessels and nerves with careful Botox usage, you can decrease pain for your patients and increase their quality of life. The one-day course also includes two other important components: dermal filler treatments are taught and platelet-rich plasma therapy training. Dermal fillers are a smart choice for helping to enhance the jawline, lips and cheekbones of your clients and can be used for the exclusive DentoX LIFT procedure, a non-surgical facelift that can make a real difference for a patient in a matter of a few minutes – with no scarring, no downtime and no general anesthetic. This procedure is explained in depth in the seminar. Perhaps the most remarkable part of your Botox training in Houston from Dr. Katz is your instruction in platelet-rich plasma therapy. PRP treatment can replace dermal fillers for a much lower cost, speed healing of medical and dental procedures and more. By refining a very small sample of your patient’s own blood, you can give them better outcomes at a lower price. PRP therapy is being used by Dr. Katz and his students to improve healing after complex medical procedures, dental bone grafts and more. Additionally, Dentox training includes a mini-course on marketing and advertising so you’re sure to see enhanced revenue after your one-day training course. Free online refresher courses are also available. And as well as the 10 hours continuing education credit you get for the course, 8 hours of additional credit are available for the refresher courses. Documentation is covered in the course, and you get listed in the Dentox Certified Practitioners Directory as well. If it’s time to enhance your practice by enhancing your skills, consider taking Botox training Houston medical professionals are sure to benefit from. 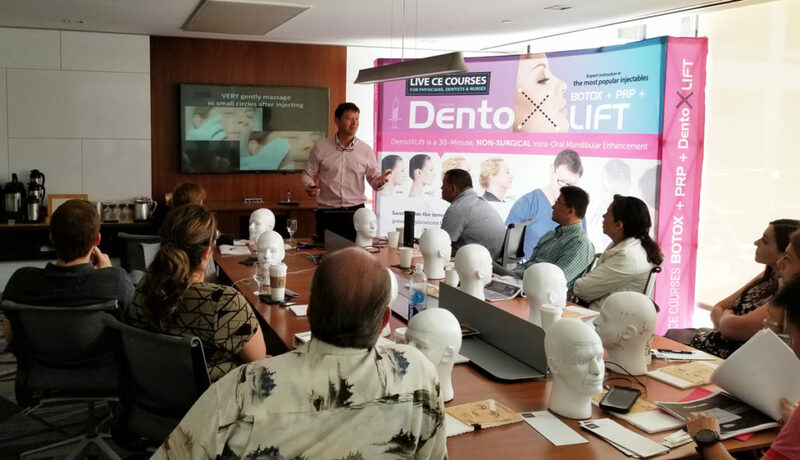 Take the Dentox one-day training seminar from Dr. Howard Katz and learn among your peers from one of the most respected names in Botox training. You need continuing education credit anyway, and there’s no more profitable way to spend a day than in training for Botox, dermal fillers, the DentoX LIFT procedure and revolutionary platelet-rich plasma therapy. It’s all available in one day – and it’s now here in Houston. Many thanks to our wonderful attendees last Saturday for a fantastic injectables course! Botox training does more than satisfy continuing education requirements. It opens the door to a new world of revenue-enhancing services that your clients and patients are sure to love. They may have been asking you about Botox and dermal filler already. Soon, you can fulfill their desires while boosting the bottom line of your clinic or practice. The class is led by the most experienced instructor. Dentox is led by Dr. Howard Katz, the originator of Botox training with a history that goes back even further. His name is on the Botox patent application, and he’s a respected, still-practicing dentist. The small class size means you get individual attention from this industry-leading expert throughout the day-long training. PRP therapy training is included. At no extra charge, your New York Botox and dermal filler training also includes instruction on PRP – or platelet rich plasma injections. Dr. Katz is the creator of this innovative therapy that takes a patient’s own blood and refines it so that you can inject it as a filler material, for results that are less expensive than traditional dermal fillers. PRP therapy also speeds and improves dental implant healing and can help with other kinds of restorative work as well. No one else is teaching the new applications of PRP for injectables. The live training happens in just one day. When you choose to have Botox training in New York from Dentox, your live training course is completed in a single day. It’s not an online course, and there’s no need to come back for followup sessions. When you finish the day, you’re ready to treat with dermal fillers and Botox and perform PRP therapy. The program is hands-on. Dr. Katz allows you to bring a patient along – maybe someone from your staff who can learn alongside you. This patient is then injected with the proper treatment under the watchful eye of Dr. Katz and the Dentox team. You can also watch other live treatments and take advantage of the opportunity to use foam heads for practice too. There isn’t any membership. There is a directory of Dentox-trained Botox providers in which you can choose to be listed, but you don’t have to participate in any kind of membership program. That means your data is your own, your privacy can’t be compromised and you won’t get an avalanche of junk mail after your course. The learning never stops. When you take Botox training New York medical professionals like you can trust and depend on from Dentox, you can then watch webinars for refreshers later – and submit specific patient questions to Dr. Katz if necessary. You get continuing education credit – and your education regarding Botox, dermal fillers and PRP therapy continues whenever you find it necessary. For a very small time commitment, you can reap big rewards from Botox training. And there is no better Botox training in New York than from Dentox. Call 858-550-9533 to reserve your spot. What students have to say.. 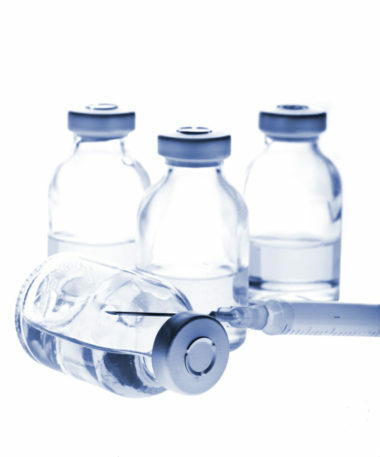 When looking to expand your practice and increase your earning potential, there’s no better idea than Botox training. But you have choices in training programs, and there are significant and important reasons why Dentox is the Botox training Los Angeles medical professionals have trusted for years. You learn directly from a leader. Dr. Howard Katz is a leader and innovator in Botox administering and training. His name is on the patent application for the Botox product. He is also a proven medical educator and the first to teach Botox classes. Since class size is small, you get individual attention from the first and best Botox educator. You learn PRP for injectable as well. When you learn Botox injection from Dentox, you also learn how to inject dermal fillers and perform platelet rich plasma injections. This therapy – developed by Dr. Katz – uses a patient’s own blood to create a viscous substance that can be used as a filler material. The cost is significantly less than dermal fillers, plus the same hardware can be used to improve the healing of dental implants and other restorative work. No one else can teach you all the applications of this new and innovative therapy for injectables. It’s live training on a single day. When you choose the Botox training Los Angeles health care professionals like you are already depending on for increased income and practice expansion, the complete course is taught in a single day. That’s one course on one day – and it’s in person, not online. You leave ready to treat patients with Botox, dermal fillers and PRP therapy. It’s a hands-on program. You can bring a patient with you – perhaps a member of your staff who will learn alongside you and then be injected with Botox by you under careful supervision. You also have the opportunity to watch others perform live treatments and to practice on foam heads, allowing you to get comfortable before you perform any treatments yourself. There’s no membership. While you can choose to be listed in the Dentox-trained provider directory after you’ve completed this Botox training course in Los Angeles, there’s no required membership. That means your data is never put at risk, your privacy is never compromised and you won’t get a lot of junk mail after your training. You can keep learning. When you train with Dentox, you can choose to watch online webinars for additional training later. 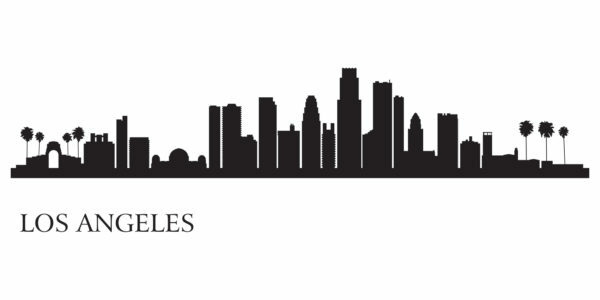 You can also contact Dr. Katz with specific questions about patients, giving you the best possible access to additional training after your one-day intensive program in Los Angeles. When you consider the high earning potential of Botox training, the low time commitment for the training and the fact that you can earn continuing education credit while learning three kinds of treatments that can often be performed in less than 5 minutes, it’s easy to see why Botox training in Los Angeles is a smart idea for your future. Call 858-550-9533 for more information on course dates and registration. There’s no better choice than Dentox for Botox training New York medical professionals can be certain will help expand and reinvigorate their practices. It’s really more than just training in proper injection of Botox. When you take this revenue-boosting one-day course, you learn three new skills that can help you better satisfy your clients and expand your client base too. No other training company can provide PRP – or platelet rich plasma therapy instruction. That’s because it was developed by Dentox founder and instructor Dr. Howard Katz, who is also a founder and innovator in Botox training. PRP injections can replace dermal fillers at a much lower cost for you and your patients than traditional filler products. And that’s not all. PRP therapy involves refining a patient’s own blood to make a serum that can be injected into fine lines and wrinkles quickly and easily. But the resulting product can also be used to speed healing of dental implants and other kinds of oral surgery. This means your patients can have better results, meaning they will likely be more satisfied with your work. Sometimes traditional dermal fillers are still preferred, and your Botox training in New York from Dr. Katz also include complete training in the proper injection of dermal fillers. Your clients will be amazed just how much Botox injections can do for them, but not all cosmetic issues can be corrected with Botox. Sometimes, dermal fillers can provide additional rejuvenation by decreasing stubborn lines or filling in sunken or scarred areas. You’ll learn that there are many similarities between injecting Botox and injecting dermal fillers and how you can complement one procedure with the other. When you complete the single-day class, you’ll be fully proficient in both procedures and understand when and why to use each one. Along with PRP therapy, this adds up to three new ways to help your clients that can increase their satisfaction and boost your practice’s bottom line. When you choose Botox training in New York from Dentox, there are additional benefits. Because Dr. Katz is the first Botox trainer in the marketplace and a researcher whose name is on the Botox patient, you’re learning from the best. He continues to innovate, and his students are the first to know of his innovations and advancements. 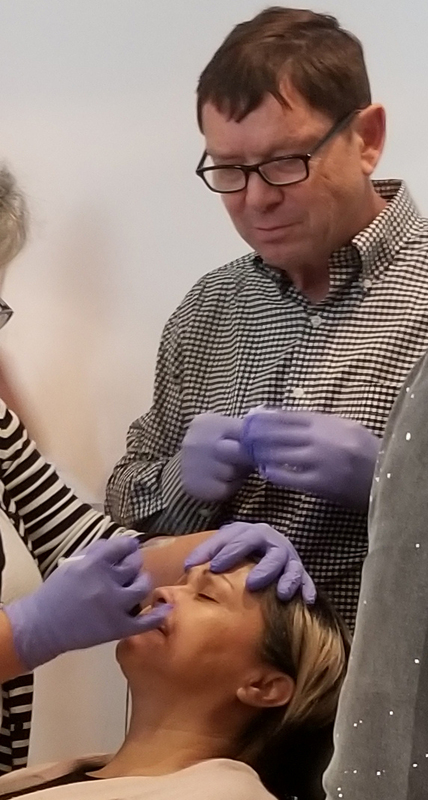 Additionally, the in-person class includes practice on a patient you bring with you, practice on foam heads and the chance to see others injecting and learning alongside you. The learning continues beyond the single-day class with recorded online refreshers whenever you need it. Dr. Katz is also available to you to answer specific questions about patients when you need him. Plus, you get continuing education credit that really advances your knowledge and enhances your practice. Why not choose Dr. Katz for Botox training in New York? When you do, you’re choosing the best in the business – and the best for your needs. Call 858-550-9533 for details. When you choose to take Botox training Los Angeles medical professionals can depend on from Dentox, you’re making a smart decision that will serve you well – and add three new skills to your toolbox. This can help you boost your practice’s bottom line and increase patient satisfaction too. In addition to learning to inject Botox from the original Botox instructor, you also learn to inject dermal fillers and perform the Dentox exclusive PRP therapy for filling lines and speeding healing. Botox provides excellent results for your clients, but sometimes Botox alone isn’t enough to fully rejuvenate the face, neck and hands. That’s where dermal fillers come in. When you take the Botox training Los Angeles medical professionals call the very best from Dentox and Dr. Howard Katz, you learn about dermal fillers as well. Injecting dermal fillers is similar to injecting Botox in many ways, so learning this valuable skill goes hand in hand with learning Botox injections. Your one-day class will make you completely proficient in dermal fillers, giving you a second way to help your clients get the remarkable results they want from you. Only Dr. Katz is offering instruction on platelet rich plasma therapy – or PRP. That’s because he’s the originator of this innovative procedure. It can help you and your clients in two ways. First, PRP therapy can replace dermal fillers for some patients – and can be completed at a much lower cost. By using a patient’s own blood to make a healing substance to be injected into wrinkles, great results are possible at a low cost to the patient. Second, PRP therapy can aid in the healing of many kinds of dental procedures, including implants. This means patients get better, faster results and are more satisfied with your work. When you learn PRP therapy from Dentox and Dr. Katz, you’re getting in on something new that few medical professionals are offering. Botox training from Dentox has other benefits as well. Since Dr. Katz is the originator of Botox training and has his name on the product’s patent, he’s always innovating – and teaching what he’s discovering. That means his students are always on the cutting edge of Botox usage. The single-day training is also hands-on, allowing you to learn in the way that’s most likely to lead to retention. You can practice on foam heads as well as a patient you bring with you, if you desire. And you get continuing education credit. Refreshers are available online – plus you can always contact Dr. Katz with your patient questions. What more could you want? 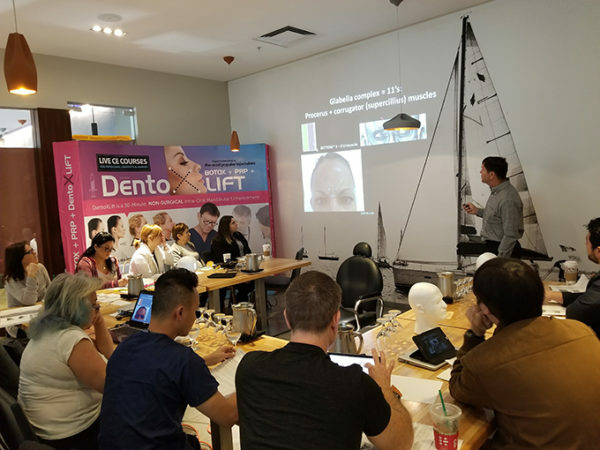 Botox training in Los Angeles with Dr. Katz and the Dentox team is a smart way to increase your skill set and boost your bottom line while making clients happier than ever before. It just makes sense to choose the very best in Botox education. It makes sense to choose Dentox.